The Canalway Trail is a network of approximately 300 miles of multiple-use trails across upstate New York. The Canalway Trail follows the towpaths of both active and historic sections of the New York State Canal System as well as adjacent abandoned rail corridors. Major portions of the Canalway Trail follow the legendary Erie Canal route from Buffalo to Albany. Along the way, the Erie Canalway Trail links the cities of Rochester, Syracuse and Utica. Over 75% of the Erie Canalway Trail is completed off-road. 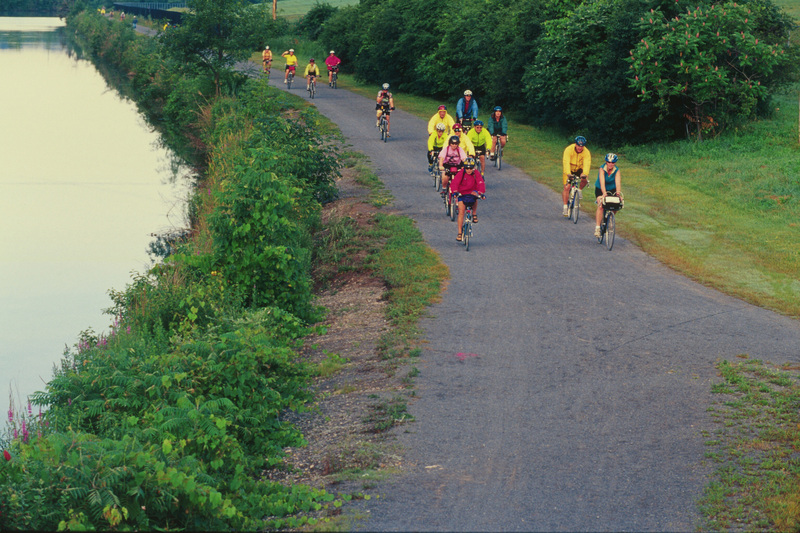 The Cycling the Erie Canal guide by Parks & Trails New York provides recommended on-street links that complete the trail route across the state. Other portions of the Canalway Trail follow the Champlain, Cayuga-Seneca and Oswego canals. The Canalway Trail is not only a great long distance bicycling destination, but also an ideal close-to-home recreational resource for biking, walking, jogging and other types of seasonal trail activities. Trailhead parking and interpretive kiosks with historic information about the Erie Canal and New York State Canal System are located at many points along the Erie Canalway Trail. The Canalway Trail primarily consists of a stone dust surface with some asphalt segments. A free map of the Canalway Trail is available from the Canal Corporation. To obtain a copy, please contact us online or call 1-800- 4CANAL4. 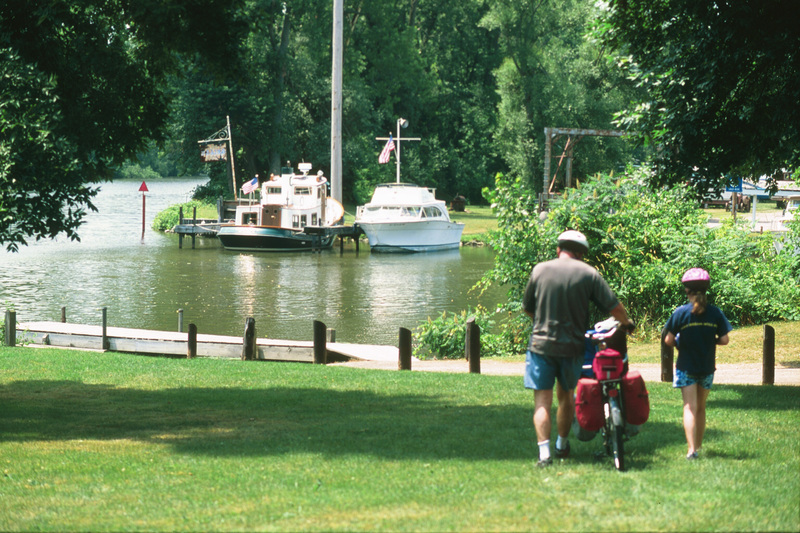 A more detailed Cycling the Erie Canal guide is available from Parks & Trails New York. Distinctive trailblazers mark the Canalway Trail route and make it easy to find. Although more than 75% of the Erie Canalway Trail is off-road, it remains a work in progress. Over 150 miles of Erie Canalway Trail have been completed over the last 20 years and more miles are slated for construction over the next five years. The Canal Corporation, along with partners such as the Erie Canalway National Heritage Corridor and Parks & Trails New York, other state agencies and local municipalities are working to complete the trail across the state. Efforts are also underway to complete the Canalway Trail along the Champlain and Cayuga-Seneca Canals. Visit Parks & Trails New York and the NYS Canal Corporation websites for more information and to learn about volunteer opportunities.